Well it's coming along. 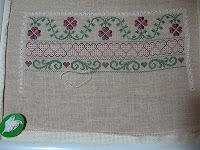 Before I dive head first into today's stitching session, I thought I would post a little peek at how it stands so far. It doesn't look like much yet, but there's more than 5000 stitches completed already. Phew! My poor little fingers are sore! When designing this, I really loved the thought of a lacy eyelet border. While stitching it, I am cursing myself for it. I love eyelets, but with around 400 (I think, I haven't actually counted them) they do get a bit tedious. I have worked out a system for getting them done without having to do too many all at once. Each time I complete a band or a dividing bar, I stitch one thread length worth of eyelets, and the cross stitches around them. That will keep me well ahead of the game I hope! I've also come up with a little cheat that helps open the middle up without me having to pull the thread so hard - I take a large needle and sort of hollow out the centre - twiddle it around a bit to really open up that middle hole - before I start the stitch. That way I just have to give a gentle tug on the thread when I stitch it. It works great. Well, I've had my little coffee break now, so it's back to the needle!